I've always had a bit of a curiosity about Infinium Labs and their Phantom video game console (officially referred to as the Phantom Game Receiver). Infinium Labs' idea was to have a x86 computer sitting under your television that would download computer games on-demand from their Phantom Game Service and provide a standard platform on which they can run. This concept was ahead of its time in 2003. We're just now seeing these principles applied at a commercial level with Valve's Steam Machines, and to some extent, the latest generation x86-based PS4 and XBox One. While the original XBox released in 2001 was the first viable x86-based video game console, it did not have support to download video games from the internet. Eventually the company renamed itself Phantom Entertainment and changed its focus to selling keyboards, having never shipped its game console. There's been a bit of speculation as to what happened. I don't have enough background to contribute to the discussion about Infinium Labs' long term viability. However, I was able to spend time with a prototype console and could tell that time and effort had been spent on its construction. Two generations of prototype consoles were created during the project's short life. The first generation console prototype was quite blocky and distinctive-looking. HardOCP destroyed one, a symbolic gesture of their frustration at their litigation with Infinium Labs at the time. Another one recently ended up in a computer repair shop, whose staff were kind enough to take photos. A second generation prototype was shown at the 2004 E3 expo. This version featured a cleaner and more contemporary design, as well as fewer input and output ports on the rear of the console. This is the iteration that I'm exploring. The outside of the console looks quite good for a prototype, but shows many signs of the manual labor involved in its construction. The body appears to have been milled out of plastic or similar material, then painted. A perspex line runs down the top and ends in a single controller port on the front. 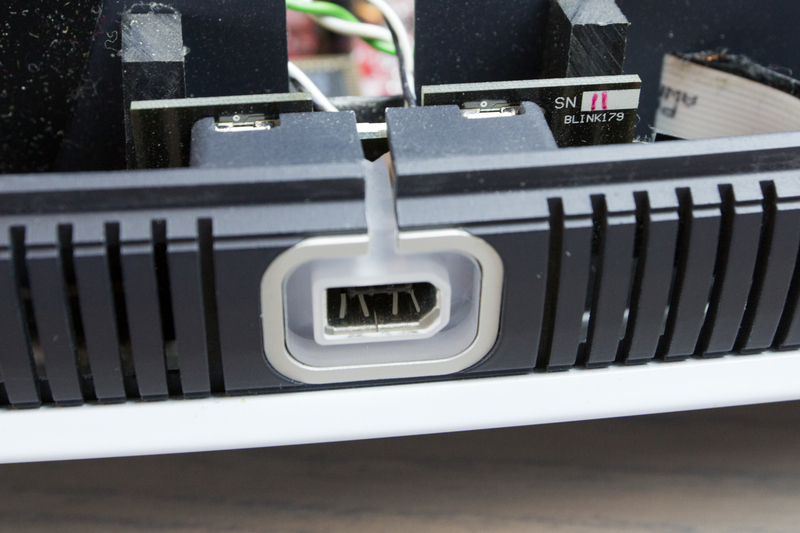 The controller port on the front is a six-pin Firewire port, but is actually carrying a USB signal. Surrounding the controller port is an oval of perspex through which four RGB LEDs shine. These form a "ring-of-light" similar to the XBox 360 video game console, but this prototype predates the unveiling of the XBox 360. The rear of the console has the power, video, and data connections. The power input is a standard IEC C14 socket. Three RCA connectors are labeled for RGB component video output, but do not output a video signal. An optical S/PDIF port supplies a digital audio signal. A clunky momentary switch allows the console to be turned on or off. 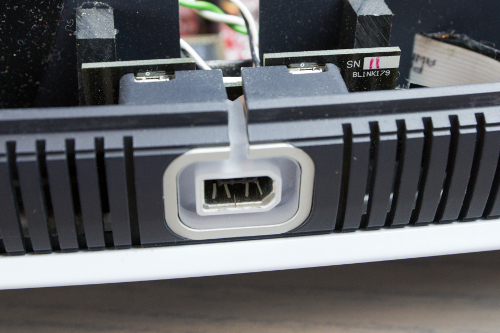 A 10/100 Ethernet port allows the console to connect to a LAN, and eventually the Internet. Two USB ports are present and useful for connecting a keyboard and mouse. VGA, DVI, and SVideo ports output video for the console. Six RCA connectors are labeled for surround sound, but do not output any signal (and aren't connected). The bottom of the console has a serial number and product information sticker. This is a nice finishing touch for a prototype device. It also hints that the console is running Windows XP Embedded. I removed four screws, two from the back and two from the bottom, and then I removed the top. The vents around the side are held in place by the top and bottom and come out in three pieces, one on each side and one in front. Inside I found parts that would be at home in any mid-range gaming computer of the time. A slightly modified Biostar M7NBA motherboard. An AMD processor running at 1.2 GHz. Two sticks of 256MB Crucial DDR RAM, for a total of 512MB. An eVGA GeForce FX 5700 Ultra 128MB AGP video card. A modified Dell PS-5161-1D1S power supply. A 2.5" Hitachi Travelstar 80GB hard drive. A custom LED driver board for the power and controller indicator lights. Interestingly, an air duct made from the thin cardboard of a Pepsi 12-pack. Perhaps this was an attempt at promotional cross-branding. 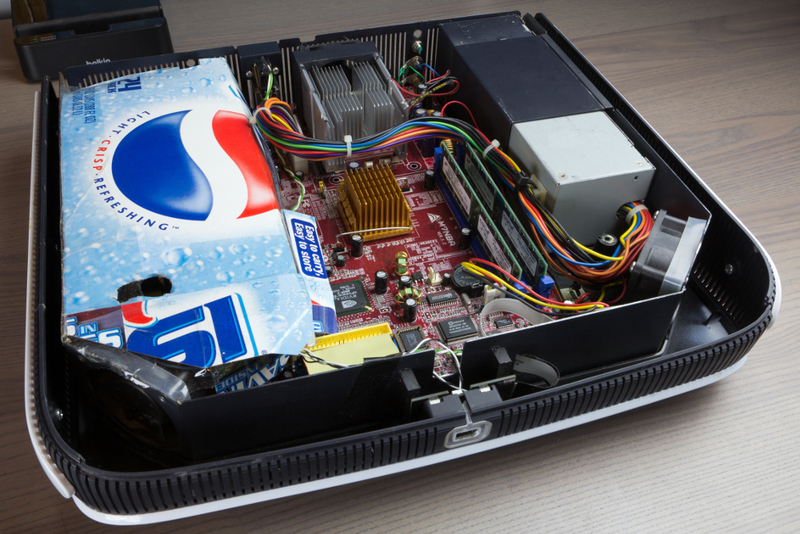 The motherboard is a Biostar M7NBA, a custom-sized motherboard for small-form-factor computers (specifically the Biostar iDEQ 200N). Normally it has a panoply of I/O ports on the front and back of the board. 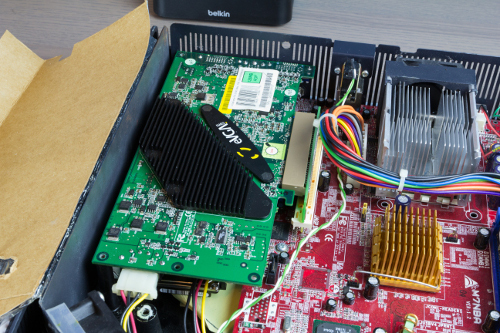 The M7NBA motherboard in the Phantom prototype had most of these ports removed, leaving only the USB, Ethernet, and optical S/PDIF ports on the rear. It otherwise appears stock. 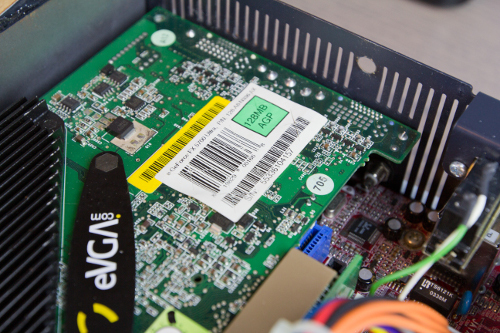 The NVidia GeForce FX 5700 Ultra video card in this unit was manufactured by eVGA. It appears completely stock. The GeForce FX 5700 was a mid-range video card released late 2003. This card expects at least a 250W power supply, which the Phantom prototype does not contain. A Dell PS-5161-1D1S power supply provides 160W of power to the console. This power supply was found inside Dell Optiplex GX computers infamous for their hideously defective capacitors. 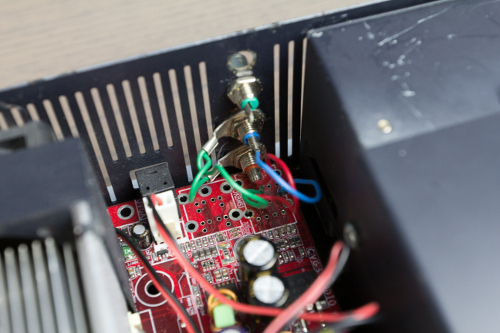 Thankfully this power supply has good capacitors and does not require rework. 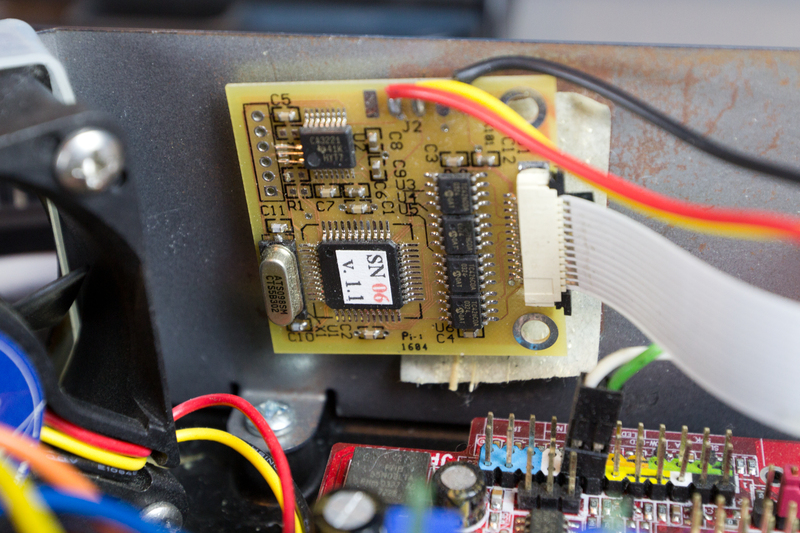 Several modifications were made to the power supply to make it functional in the prototype: the rear voltage selection switch has been removed, several output wires have been removed, the fan grill has been removed, and the fan appears to have been replaced. Under the video card is the hard drive running the operating system and presumably caching the games downloaded from the Phantom Game Service. There are also several unconnected RCA connectors for surround sound audio. The real audio for the console is running via the bottom two RGB video connectors which have been soldered directly to the motherboard. I pulled the hard drive and imaged it, hoping the software would be more interesting than the hardware. Having working software would demonstrate that the company was attemping to create something more than vaporware. The hard drive had a few unrecoverable sectors, but CHKDSK was able to repair the filesystem without much trouble. During this process I found ddrescue to be a pretty fantastic tool. The boards which run the LEDs are the really the only custom piece of hardware, except for the case itself. The two boards are joined together by a bit of flatflex. An internal board has the microcontroller and MOSFET LED drivers, and an external board has the five LEDs and front controller port. The boards are connected to the motherboard for power and two USB connections: one for the front controller port and another to control the LEDs. I've found some files on the hard drive which indicate the LED boards were designed by an outside consultant. I have been able to boot the console successfully. A bit of repair work was needed before it would do this. The hard drive was replaced, as the original had bad sectors. The ram was reseated, having come slightly unseated during shipping and handling. The clock battery was replaced, as it measured 0.1V. The video card was replaced, as the original was displaying video artifacts and preventing about 2 out of every 3 boots. I sourced another GeForce FX 5700, manufactured by BFG rather than eVGA. I'm slowly figuring out how to start the Phantom shell and start the user interface. I'll write a follow-up post once I've solved that. I write software and take things apart.